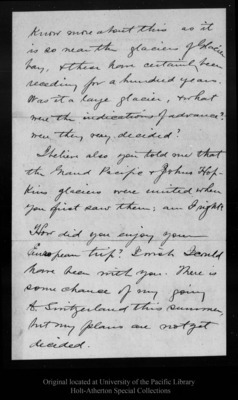 Letter from [Harry Fielding Reid] to John Muir, 1894 Apr 18.
know more about this as it is so near the glacier of Glacier bay, & these have certainly been receding for a hundred years. Was it a large glacier, & what were the indications of advance? were they very decided?I believe also you told me that the Grand Pacific & Johns Hopkins glaciers were united when you first saw them; am I right?How did you enjoy your European trip? I wish I could have been with you. There is some chance of my going to Switzerland this summer, but my plans are not yet decided.